At Christchurch CofE Primary School it is our belief that by planning for both academic and personal development, all children are able to learn effectively so that they are equipped to grasp all the opportunities available to them in a rapidly changing world. These secrets will underpin our school expectations (rules) and our curriculum and the core skills that are taught to your child every day. 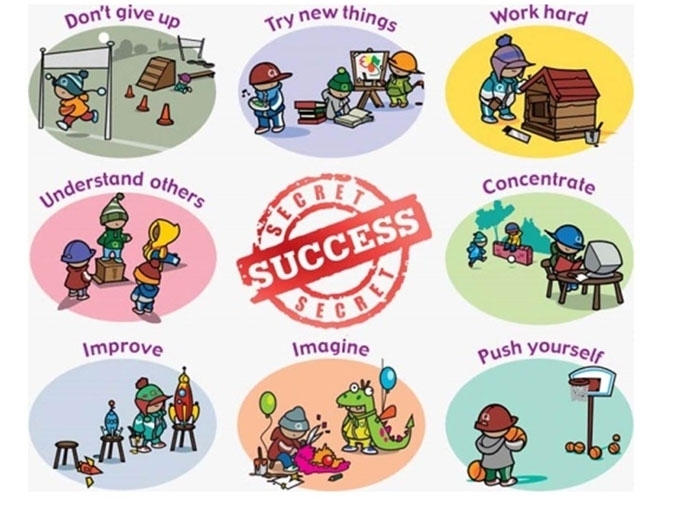 These eight ‘secrets of success’ are taught throughout our school with a focus upon a new secret each half term. Each secret links to a Christian value in line with our Christian ethos. If children are willing to try new things, they may just find something they are good at. Even better than this, they may find something that they love doing. Most successful people love what they do. Although it may seem attractive to design a curriculum that is fun for children, it is also important to plan activities that will make children work hard. No real success comes without hard work. Successful people learn to give their full attention to whatever they are doing. Allowing children to focus on things that interest them, whilst at the same time learning all of the content that is required, is a great way to secure engagement. Successful people need to push themselves. A great curriculum needs to push children and teach them about the need to push themselves. Of course, it is much easier to push yourself if you see the point to what you are doing. That is why the curriculum needs to be engaging and relevant for children. Successful people have ideas. They use their imagination and are prepared to be wrong. The curriculum needs lots of opportunities for children to use their imagination. Real accomplishment does not come from doing something once and moving on. It comes from lots of tweaks and refinements. Successful people are always trying to improve what they do. No one has experienced success by thinking about themselves. Successful people understand others. The curriculum needs to help children to realise that collaboration is what the real world is about. The curriculum needs a certain degree of danger and risk if children are to experience the real world. They need opportunities to fail in a safe environment and learn to have another go. At Ellesmere Port Christchurch we show respect to God’s world and creations.